Now the sun is shining and the birds are singing and insects of all sorts are buzzing and humming and chirping. In fact, there are loads of insects. It’s one of those days when the damsel flies are swarming, doing their brief romantic aerial ballets to attract mates and perpetuate their species. It’s one of those days when the grasshoppers are doing their best to eat everything in sight. It’s one of those days with yellow swallow-tails and monarchs and viceroys and white cabbage butterflies are flittering all over the place. In some Episcopal churches on All Saints Sunday, there is a tradition of filling the chancel area with pictures of the saints, with icons big and small. In fact, in Eastern Orthodox churches there are always a bunch of icons on a wall that separates the nave, where the congregation sits, from the altar area. It’s called the iconostasis. In Eastern Orthodox Christianity, icons are often called “windows to heaven” because they are said to offer us a glimpse of what awaits us in eternity with Christ. A few years ago we used a Vacation Bible School curriculum which said a similar thing about the Holy Scriptures. The Bible, said the VBS materials, is a window that shows us God’s heart. In the Bible, we see what God is like. The Bible reveals God to us just like the windows in a car show us what is going on outside. I love to pray with icons and I love that notion of what the saints and the Bible are: windows to heaven or windows that shows us God’s heart. Now I don’t know about you, but when I am driving in a car on a day like I described to you, a day when the windshield gets are splattered and messy with dead bugs and mud, I have a hard time looking beyond that cloudy window in front of me. I get distracted by the details on the window; I focus on them and not on the road out in front of me. For a few years, I had the privilege to mentor an Education for Ministry seminar group at the cathedral. It is made up of students in all four years of the program so every year there were folks working through study of the Old Testament. Very early on these first-year students discover that the People of God are not a very pretty bunch: Abraham is a liar; Jacob is a cheat; Joseph’s brothers are petulant bullies who nearly kill him; Moses whines a lot; and Aaron (Moses’ brother), although he is the first high priest, is the one who turns the people away from God and fashions the golden calf for them to worship! The first-year students always found it difficult to look past the peccadillos of the Patriarchs in order to see the God who is behind the stories; just like it’s difficult to look past the bugs and the mud on the windscreen! That’s only natural because we all sort of want the Bible to be an answer book, to lay it all out for us in simple and easy-to-follow instructions. We want to be saints, like the people we celebrate today, and we want the Bible to tell us how to do that. We want to be able to say, as Sunday School children are often taught to sing, “The B-I-B-L-E, that’s the book for me! I stand alone on the word of God, the B-I-B-L-E!” We just want it to be clear! But the Bible doesn’t exist to be the object of our devotion; the Bible doesn’t exist to be regarded on its own and for itself. The Bible is a window through which God is reveals Godself to us and, like any window, it’s got some distracting stuff we have to look past. It does so because it is a book (several books, actually) full of human stories, and human stories are messy. So the Bible is filled with stories of people who are sometimes liars and cheaters; people who can sometimes whine and be unfaithful. We end up with stories of weird hallucinations and frightful dreams. We end up with poetry by someone who’s been hurt so badly that vengeance and revenge can look like a gift of God. We end up with troubling warnings that we might, probably will, face hunger and grief. We end up with something that pretty much describes something not to dissimilar from the world we live in. How do we look past that to see the Christian hope, to see something like the vision both the Wisdom of Solomon and the Book of Revelation paint for us today, to see the righteous in the hand of God and God dwelling with God’s people where “mourning and crying and pain will be no more”? Well, when we were on our drive through the countryside with our windshield splattered with bug goo and mud, we pulled into a gas station, and a mechanic came out and washed all of that away. Remember? Today is the day that we remember those who help clean away all of the distractions, the filling station attendants of the faith. Today we remember the saints who help to clear our vision of God. Broadly speaking, of course, the saints are all those who are baptized, who follow Jesus Christ, and who live their lives according to his teaching, which would include all of us here today. Church tradition, however, also uses the term more narrowly to refer to especially holy women and holy men who are heroes of the faith, who through lives of extraordinary virtue reveal the Presence of God to us, who clean that window through which we all look. The saints whom we celebrate on this day (and the many who are given special days of individual recognition) were people who tried to live according to the Bible as they understood its teachings. Like us, they read it and encountered all its troubling visions, those petulant patriarchs, those bloodthirsty psalms, and somehow looked past them and through them to see the God of faith, the God who Incarnate in Jesus said, “Love your enemies, do good to those who hate you, bless those who curse you, pray for those who abuse you.” We extoll the virtues of those saints and we celebrate their lives and their witness because they help us to do the same. 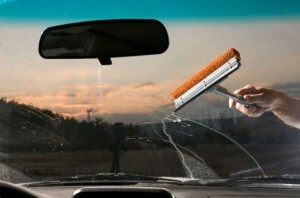 By their lives and their examples, they clean the windshield for us; they clean away the bug blood and the mud, so that we no longer focus on the window, but on the God the window shows us. Indeed, they become windows themselves, windows to heaven, windows that show us God’s heart. This is not to suggest that we should not study nor seek to understand the murkiness and cloudiness that we find on the window, the questionable and troublesome visions, the lying and cheating of the Patriarchs, the occasional bloodthirstiness of the Psalmists, or the petulant pettiness of the Prophets. Certainly, we should for we can learn thereby of the graciousness of the God who overlooked and overcame those faults, who regarded and redeemed those men and women! But following the example of the saints before us, we save ourselves from being distracted by all that so that we do not fail to see and appreciate God who forgives all that. Today we give thanks for the saints, the filling station attendants of the faith, who help us clean our windshields, who are themselves windows to heaven. This homily was offered by the Rev. Dr. C. Eric Funston on All Saints Sunday, November 4, 2018, to the people of St. Paul’s Episcopal Church, Medina, Ohio, where Fr. Funston is rector.